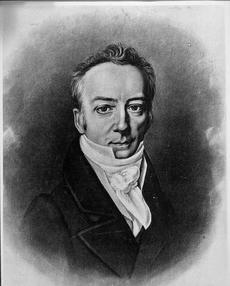 James Smithson (c. 1765-1829), founding donor of the Smithsonian Institution, was born in 1765 in France with the name James Lewis Macie. The illegitimate son of Elizabeth Hungerford Keate Macie and Hugh Smithson, 1st Duke of Northumberland, he changed his name as well as his citizenship, becoming a naturalized British citizen around the age of ten. After his parents' death, he became known as James Smithson rather than James Macie. On May 7, 1782, he enrolled in Pembroke College, Oxford, and graduated four years later. The natural sciences sparked his interest, and he established a solid reputation as a chemist and mineralogist, during the exciting period when chemistry was being developed as a new science in the late 1700s. Committed to discovering the basic elements, he worked diligently to collect mineral and ore samples from European countries. Excerpts from his notes show that his field excursions often forced him to brave the elements and do without the upper class comforts known to his parents. Smithson, although a wealthy man, was determined to make a name for himself among scientists. He kept accurate records of his experiments and collections, and his publications earned the respect of his peers. The Royal Society of London recognized his scientific abilities and accepted his membership on April 26, 1787, only a year after he graduated from college, an unusual honor for someone so young. The society became an outlet for publishing many of his papers, which covered a wide range of scientific topics, and also was a meeting place for Smithson and other scientists. James Smithson wrote a draft of his Last Will and Testament in 1826 in London, only three years before he died. He died on June 27, 1829, in Genoa, Italy, where he was buried in a British cemetery. The will left his estate to his nephew, Henry James Hungerford, and stated that if his nephew died without an heir, the money would go "to the United States of America, to found at Washington, under the name of the Smithsonian Institution, an establishment for the increase and diffusion of knowledge ...." After his nephew died without an heir, Smithson's estate did come to the United States and a debate began about what this new institution would be. First, Richard Rush, an attorney from Philadelphia, filed a lawsuit in London to get the Smithson estate for the United States. Rush brought Smithson's personal effects to the United States in 1838, along with the money from his estate. Then Congressional debates continued until 1846 when legislation was passed creating the Smithsonian Institution. Unfortunately, a fire in the Smithsonian Institution Building or Castle in 1865 destroyed many of the Smithson letters, diaries, and other papers originally acquired by the Institution. As a result of the fire, the Smithsonian Institution Archives does not have very many of James Smithson's original letters or other papers. Among those that the Smithsonian Institution Archives does have are a handwritten draft of Smithson's Last Will and Testament, dated October 23, 1826, and his "Receipt Book" containing formulas for food, beverages, and everyday products. Smithson's Last Will and Testament, October 23, 1826. Recipe for Tooth Powder in James Smithson's Receipt Book. The Lost World of James Smithson: Science, Revolution, and the Birth of the Smithsonian, by Heather Ewing. "From Smithson to Smithsonian: The Birth of an Institution"